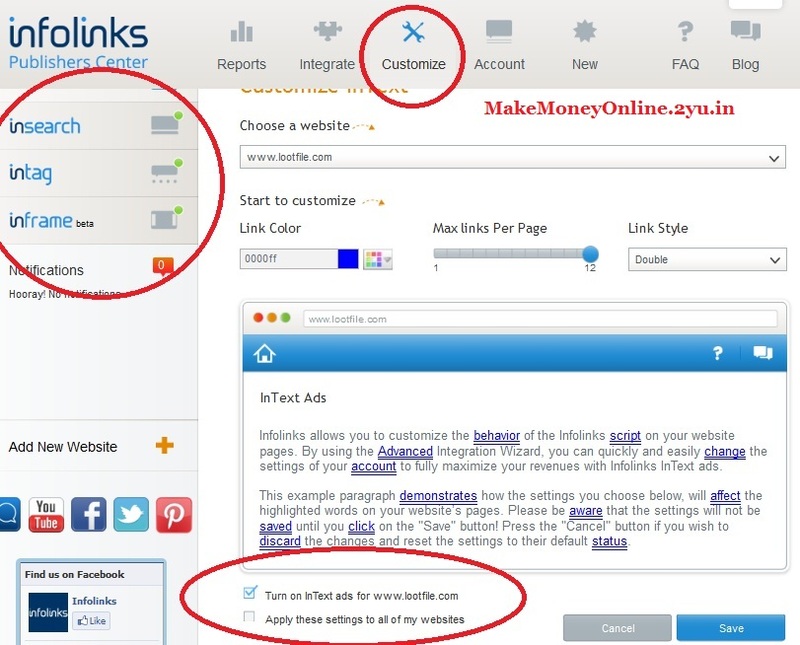 Infolinks Review 2013: Website Monetization with Smart ad units In-Text Advertising – How To make Money Online ? In 2007 Oren Dobronsky & Yariv Davidovich had Started the Infolinks Journey and Since then Infolinks is growing more and more with a Aim greater revenue to publishers and higher levels of performance for advertisers.Infolinks reaches to 150,000 sites in 150 countries with ad products including InSearch, InTag, InFrame, and InText and Generating high revenue’s. Infolinks is Situated in Palo Alto, CA, USA. Presently Dave is CEO joined Infolinks in 2012. Payment method: Paypal, echeck/local bank transfer, wire transfer, payoneer pre-paid debit card. Transaction fees apply: 2% of the amount, maximum US $10.00. Additional PayPal transaction and withdrawal fees may be applied by PayPal. How to join infolinks as a publisher? Step1: Apply for Infolinks account if your website displays more text contents than images and videos. Click on following link to join infolinks as a publisher. 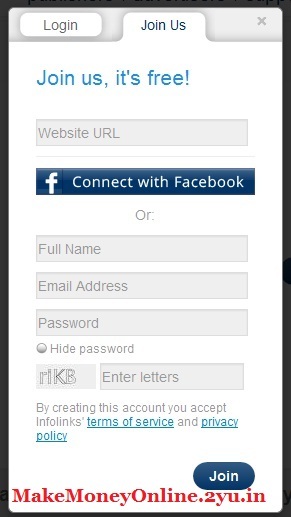 Follow signup steps. It won’t take more than 2 mins. The website you submit during signup will be verified by Infolinks and will send you account activation message through email. Once your account is approved for one website, later you can apply for your other websites through the same account. Step 2: Setup other account details like your personal information, payment information, tax related details etc. Step 3: Placement of ad units in your website: once your account is verified and website you submitted is accepted, next step is to get the ad code from Infolinks and insert into your website or blog. This is a two step process. In first step you get the code for overall website, which links Infolinks to your website. 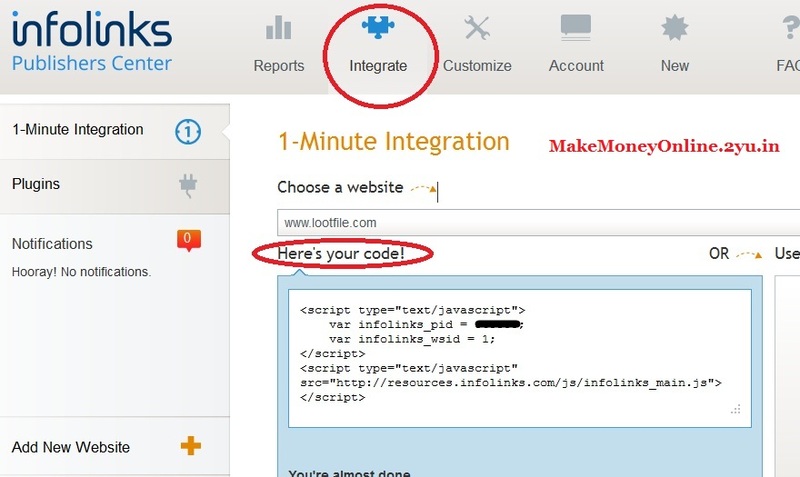 For this you will have to go into Integrate option, here you first choose website if you have registered multiple websites in Infolinks account and then insert the code you get here into your website. In the second step you need to turn on a particular type of ad, only then it will be displayed on your website. You can also set options such as link colors, max links etc for the ad units you are settingup. For this go to customize option. Infolinks also provide plugins if you want to apply ad units for blogger, wordpress, drupal, & joomla. InTag ads earn you highest revenues as compared to other types of ads. 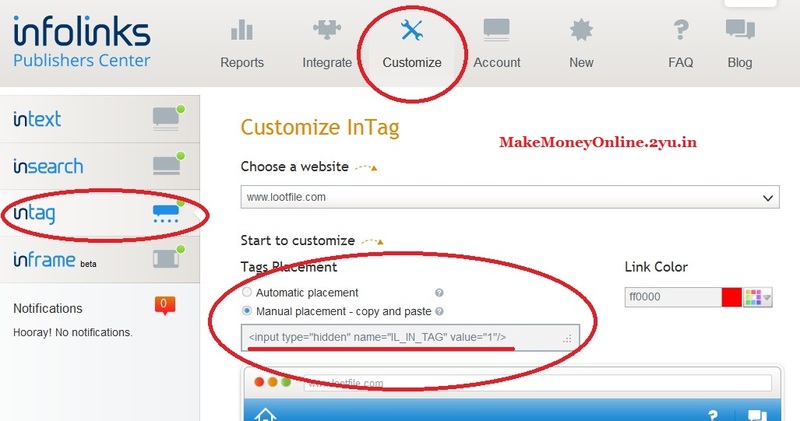 While turning on InTag ad from your account setting, you have two options, either you can set Tags placement manual or automatic. In case of automatic setting, Infolinks will automatically decide the place for Infolinks InTag ads on your web page, however, in case of manual mode, you will get a code which you can insert at any desirable place in your web page, the InTag ad will be displayed at the same place. There is no limit on the use of InTag ads. Thats it!! Now bring traffic to your website and earn dollars 🙂 !!! Infolinks provide mainly four types of ads that you can publish on your website . Most of these ads are text based. This type of ad appears only when a user visits your website through search engine. If your website is not what user wants then inplace of clicking back button of browser window and increasing bounce rate of your website user can click on Insearch ad since the ad contents are search result oriented and hence it is also helpful in improving SEO of your website. After appearing for a few seconds it shrinks down to a quiet headline. 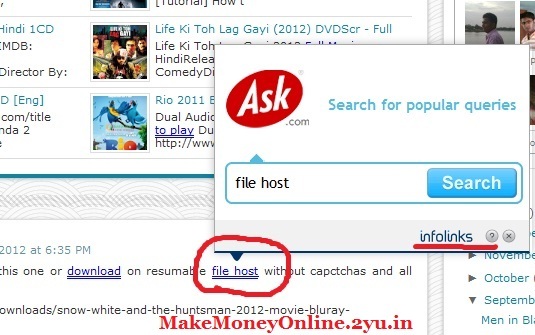 Infolinks automatically search your web page and look for valuable keywords. These keywords get underlined and color changed. The keywords underlined are chosen intelligently by analyzing the contents of page hence increases the chances of ad views and increasing money flow to your pocket!! When mouse hover is made over such keywords an ad is displayed. If compared to banner ads, then it improves over the blindness caused by banner ads. The most relevant keywords are chosen by intelligent algorithms by analysing the contents of your website and shown in an attractive tag cloud. Intag ads can be customized according to the design and layout of your website. Every corner of your website is precious for earning! 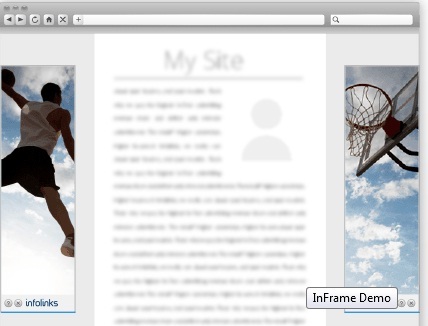 InFrame infolinks ads can make use of the unused areas of your website such as unused screen margins. This is the best thing about this product since you need not to provide a valuable portion of your website space specially to display ads!! Infolinks automatically detects the unused margins of your website and the browser screen is widened or wide screen monitors are used, and display ads on this portion of your website. These ads stay stationary when user scrolls down or up your website.